Watermarking functions as an effective way to add digital signatures to your photos, thus helping you avoid the unpleasant surprise of finding them used without your permission by plagiarists. 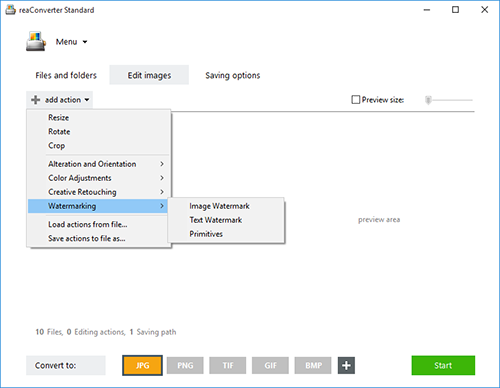 In addition to supporting image and text watermarking, reaConverter allows you to do batch image watermarking using primitive drawings. Also described as basic elements used in computer graphics to help in structuring more complex images, primitives can take the form of lines, squares, circles and other similar shapes. reaConverter includes a simple and intuitive feature for watermarking with primitive drawings, that also involves a rich array of customizing tools. Add one or several images to reaConverter. 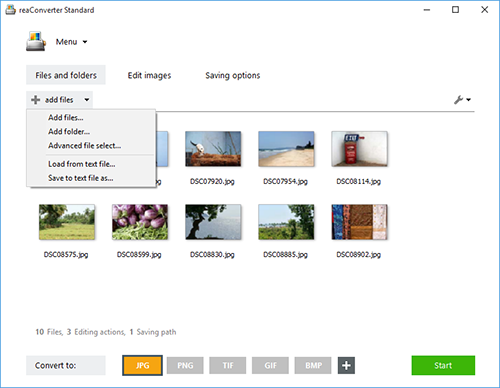 Use the file browsing tool or drag-and-drop them directly into the software window. 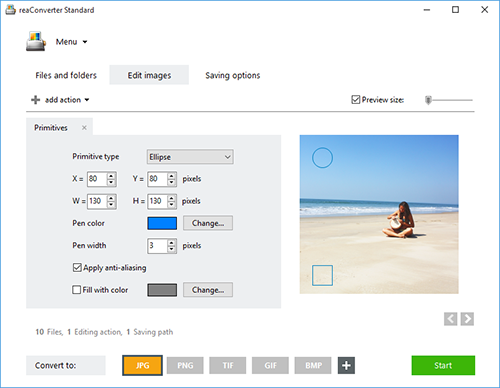 Go to Edit images, click the Add action button and then Watermarking. Here, pick the Primitives option. Next, choose the type of primitive drawing you intend to use — point, line, rectangle or ellipse, and then customize it accordingly. You can then change the coordinates of its location, its color and width, as well as fill it with color and apply anti-aliasing. The result of your selections can be easily checked in real time, by ticking the Preview button, in the upper right part of the window. In the Saving options section, pick the location and format of your watermarked images. You can save them in a cloud storage or in a local folder. Finally, click on one of the buttons conveniently placed in the lower part of the screen in order to decide the extension of your edited images. Then press Start and your new images will soon be ready. 2. Point shape (Syntax: s, c) where "s", "c" mean square (default), circle. Command-line drawing tool is an advanced feature meant for professional use, and is available in Pro edition only.